The key to creating an effective budget, whether you’re creating a monthly or annual budget or planning a budget for an upcoming vacation, is that you need to account for everything. The numbers on your budget should align with what you’re actually spending—or at least include all of the types of expenditures that you expect. March 25, 2018, 9:16 p.m.
At WealthMeta, we value thoroughness in financial planning, and think that people have a better chance of reaching their financial goals if they look at the entire financial picture. Some people will tout their super-frugal budgets but leave out spending on health care in spite of having high-deductible insurance, for example. That person might be able to keep to the budget, but it isn’t entirely realistic. That said, blowing your budget over a broken arm is not the same as blowing your budget on a new TV. The same goes for vacation budgets that don’t account for food or local transportation—unless you’re going on an all-inclusive cruise, you’ll need to eat while traveling. So what should you include in your budget? Here’s a basic guideline for what categories should be in your budget. Budgets aren’t just about expenses, they are about balancing your expenses with your income. Your monthly budget should include all of your sources of income on a monthly basis; your annual budget should have your annual income. Your deductible and out-of-pocket maximums. If you’re creating a family budget, make sure you’re taking into account the deductible for each person. You eat, right? Unless you grow your own (or hunt and gather it all), you’ll need to buy food. Food should go into two categories: Groceries and eating out. Kids can be expensive, and the kinds of expenses incurred change over time. The most expensive periods are when they are very little and need a lot of care, and again when they are in college. You’ve already accounted for eating out in the ‘food’ category, but if you go to the movies, to concerts or take a vacation, you should include that in the entertainment category. 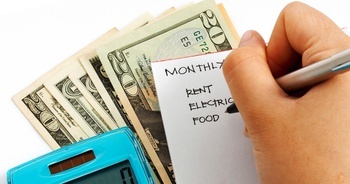 The bottom line when it comes to creating a budget is to capture all of your expenses. You might spend $0 on housing but thousands on your education… for example, if you’re living with your parents’ but in the midst of your college education. The important thing is to create an accurate picture of your income and expenses and use that picture as a plan for meeting your financial goals. You may be interested in our printable household monthly spending sheet as a free an non-techie way to get a handle on your budget. Also check out our Home Budget Tracker if you are interested in using an app to track your finances.